in the area. Most visitors to our condo return repeatedly. Our lovely 3 bedroom 2 bath,is on the "sunny south shore" of Maui. completely equipped to make your vacation "No Ka Oi" (the best!). and dryersr are available on each floor. 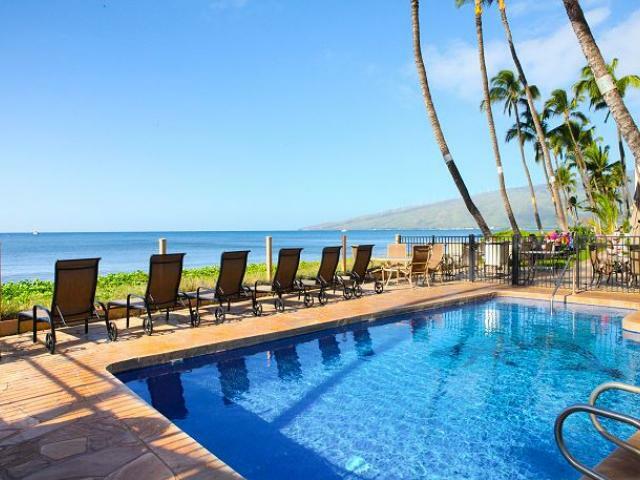 sunsets and even whale watching in season from the lanai. winds The Condominium is located on a 3 mile-long sandy beach. Swimming, snorkeling and jogging abound. Casual and upscale restaurants nearby. Very competitive rates. 265.00- $295.00(depending on season). These are well below most oceanfront condos list rates. Price depends on the time of year and season.